Veligandu Island Resort & Spa offers one of the best value for money all-inclusive packages in the Maldives. 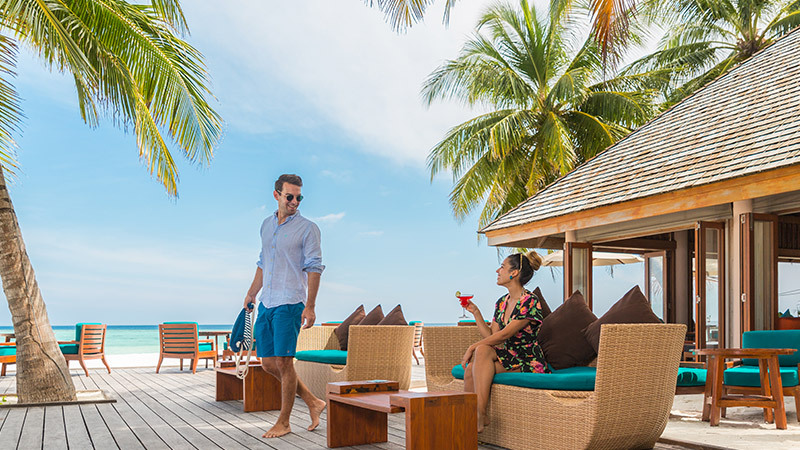 Opt for a more relaxed and carefree holiday of your dreams with our All-Inclusive Plus package. Enjoy this excellent meal plan which includes the following benefits! All buffet style meals are served in the Dhonveli Restaurant, featuring a satisfying spread of ‘all you can eat’ themed dining. Experience a variety of menus sure to sate everyone’s taste. The added benefit of the 24 Hour Snack Menu­ served all day and night in the Thundi Bar. Delight in an unlimited ‘all you can eat’ special Snack Menu; including pizzas, burgers, and ice-cream from 10:00-19:00, served in Thundi Bar. Soft drinks – Coke, Diet Coke, Fanta Orange, Sprite, ginger ale, bitter lemon, iced tea, tonic, and soda water. Coffee, tea, iced coffee, iced tea, espresso, cappuccino, latté and macchiato – freshly brewed, not canned. Blended drinks – milk shakes & smoothies. House table wine – red, white and rosé. House brand spirits – gin, vodka, rum, whisky, tequila and brandy. All cocktails and mocktails – house brand spirits. Veligandu bottled water (1 litre), house brand and bottled water (1.5 litre) – both non-carbonated. Soft drinks – Coke, Diet Coke, Fanta Orange, Sprite, bitter lemon, tonic and soda water. Juice – orange and mixed fruit. Wine – red, white and rosé. The minibar is refilled once per day as per schedule. One Sunset Cruise, as per schedule. One Kuramathi or Rasdhoo Excursion, half day, as per schedule. One 1/2 hour Group Snorkelling Lesson (equipment not included), as per schedule. One 1/2 hour Group Windsurf Lesson (equipment included), as per schedule. Free use of the fitness centre, daytime use of the volleyball and badminton courts; table tennis, billiards, darts and football grounds (equipment included). Free Yoga Session by Duniye Spa; group sessions, as per schedule; includes Pranayama, Asanas and Yoga Nidra. Food and beverage are for your own consumption; beverages are served one glass at a time, while at the resort’s restaurants or bars. Veligandu only accepts guests 12 years and older in the Athiri Bar. Management reserves the right to not serve alcoholic beverages to inebriated guests. The All Inclusive Plus package needs to be booked for the guest’s entire length of stay. Guests must sign all food and beverage bills, except buffet meals. Bills do not include prices and no charges will be posted to your hotel account for the benefits included in your All Inclusive Plus package. Please remember that charges not included in the All Inclusive Plus package must be paid upon check-out. If you have any questions, please contact Veligandu Reception.